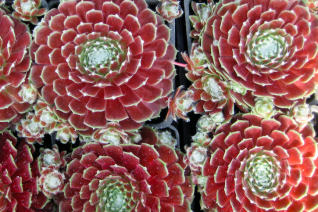 Probably the best standard red Sempervivum. Its been around forever and its a good cultivar. Given rich soil that drains well but is enriched with fertilizer a single rosette can swell to 6″ wide. its impressive. 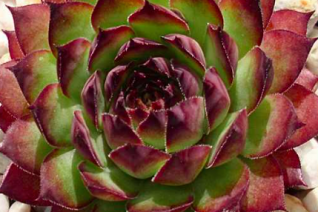 So fertilize your Hens and Chicks and turn up the scale. Forms prodigious offsets quickly. 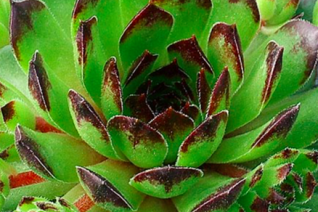 These can be stuck in the soil wherever you can’t get enough of Sempervivum ‘Saturn’. Full sun give the best color red as well as a bit of stress. Red persists through winter which is useful for winter containers. Makes a good small scale ground cover that is dense enough to suppress weeds. Don’t try to cover an area more than a few square feet. This plant doesn’t do that. Living walls, crevice gardens, rock gardens, rock walls. Hot slopes. Drought stressed plants don’t die they shrink and plump back up quickly with irrigation. Pink flowers in summer. A really fun and rightfully famous cultivar. Celery green leaves are tipped in black. Very dramatic and the kind of contrast that makes a plant stand out. Rosettes are 4″ across and offsets are produced constantly. Very pretty dense small scale ground cover. Rich, well drained soil with regular summer irrigation. Deals with drought by shrinking. They rehydrate with the first rains. They look better and grow faster with water. Excellent in containers, crevice gardens, rock gardens, rock walls, troughs. I’ve never seen this variety bloom but I assume the flowers would be red or white…doesn’t matter thats not the point. Detach babies and give to neighbors with the official name. Increases its specialness, impresses the neighbor. This would be a good variety for a living wall. Pretty Maria. Bloody Maria. 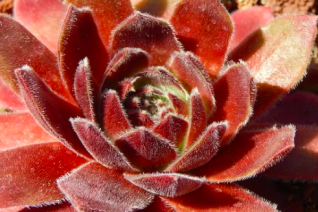 We have no idea why they named this stunning blood red Semp after her but I’ll bet its quite a story. 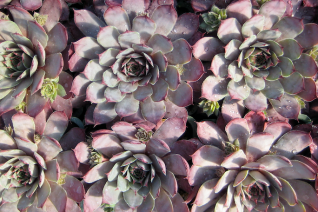 As this is quite an extraordinary Hens and Chicks. Blood red tipped leaves often fade to green near the center of the rosette. Redder in summer in full sun in average, well drained soil. Each 3″ wide plant is in a continuous color change so its a varied pattern. Forms expanding colonies quickly. Full sun to part shade. Light summer water. Very good for contrast in rock gardens, rock walls, crevice gardens. In summer 4″ stems display red flowers. Easy to detach and move babies. Tolerates drought by shrinking, puffs back up with the first rains. Cob webs cover this adorable and fast multiplying Hens and chicks. The hairy webbing is a successful strategy to stop transpiration of liquid from the leaves and cool the surface as well. 2″ wide rosettes create many offsets in a short amount of time. It makes a good small scale ground cover From spring to autumn it may produce a 5″ stem directly from the center of the rosette and bear rows of rosy pink flowers. That rosette then dies but it produces prodigious amounts of babies. Full sun to part shade in enriched, well drained soil with light summer irrigation. Without irrigation it will survive but shrink. Containers, rock gardens, gravel gardens. Good appearance year round. OOOMMMMM. 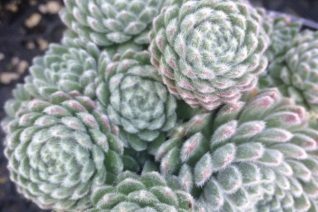 Large growing Hens and Chicks with pale lavender gray rosettes to 5″ across. Very showy and multiplies moderately fast. Full sun to part shade in rich, well drained soil. Regular water speeds growth and size of the plants. Otherwise extremely drought tolerant..in really dry conditions the rosette will shrink and go to sleep- awakened by autumn rains. Nice small scale, dense ground cover. Striking in living walls and a natural for containers. 5″ spikes send up pink flowers spring – autumn. Good looking year round. 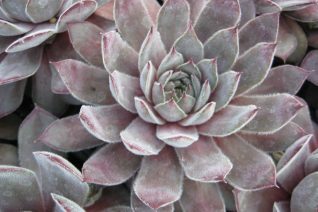 This one is the size of a small Echeveria and would make a good replacement that is actually permanent. Easy. RED Robin! Thats how we remember the name of this snappy Hens and Chicks. 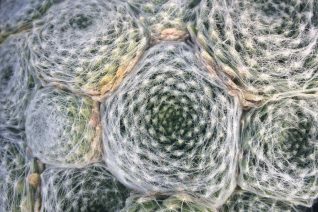 Tightly growing leaves in a medium sized rosette to 3″ across. The interior of the leaves are bright red with green leaf tips. Multiplies quickly. Retains these bright colors well throughout the year- where as some can become rather dull in winter. Spring – Autumn it may shoot up a 5″ spike bearing pink/red flowers. The rosette then dies but there are so many offsets that you would never know. Move them around the garden like furniture. Easy. Give them to friends, knock squirrels out of the tree with them. Fun to grow. 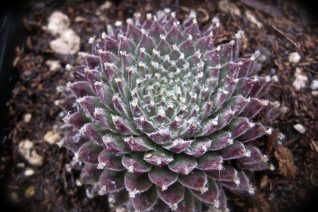 Interact with your sempervivums and all will be good. Full sun and regular summer water to remain vigorous and bright and showy. 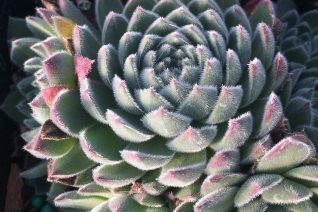 There are so many good Sempervivums (Hens and Chicks) but it seems that you only see the same 3 kinds over and over. We dug a little deeper and found a collection of exceptional cultivars. This girl/guy forms a very dense rosette with closely spaced leaves in a spiral arrangement. The older the leaves the more red as an under color with soft white hairs all throughout. New leaves have an aquamarine glow. Nice little symmetrical multicolor effect. Things go more towards green in the heat of summer. Pink flowers rise up on 6″ spikes spring to autumn- whenever it feels like it. Great container plant or small scale ground cover- this one multiplies very fast by offsets. Baby you’ve come a long way. Rich, well drained soil with light but consistent summer moisture. Rock walls, troughs, winter containers.